Sai Baba: What is a meaning of puja? Lady: Puja is a worship of God. Sai Baba: Think like this. We say: "This is my handkerchief." It means that I am separate from the handkerchief. We say: "This is my body" It means that I am different from my body. "This is my hand". "This is my leg". It means that I am not the hand and not the leg. But who am I? I am the consciousness inside this body. Consciousness is everything. Consciousness is God. But nowadays too many people have body consciousness. Sai Baba: It is very important to control your five senses. This is the best sadhana. Meditation and repetition of Gods Name is not necessary. If you control your sense organs just for eleven days you will get Moksha, Mukti, Nirvana, Liberation. Sai Baba: Very good. During meditation you should look at the tip of your nose, like this (demonstrates). If you keep your eyes fully open, your attention will be easily distracted, this is Raja guna. If you close your eyes completely, you may fall asleep, this is Tamo guna. Therefore you have to keep your eyes half-closed, looking at the tip of your nose. Then you will reach Sattva guna. And you always have to keep your mind here (points at the area between the eyebrows, third eye), and not there (points at the chest). Here is the mind's real place. Here is God. Don't talk evil, talk what is good, Don't hear evil, hear what is good, Don't see evil, see what is good, Don't do evil, do what is good, Don't think evil, think what is good. Think of God always. Mira used to spend all her time in the Krishna temple.. Once there came her angry husband and started shouting at her: What are you doing here?! Go home and do your household duties! He forbade her to go to the temple. At first, Mira got very upset. But then she understood that all temples are built by human beings and that body is the only temple built by God Himself. She started worshipping Krishna within her heart. 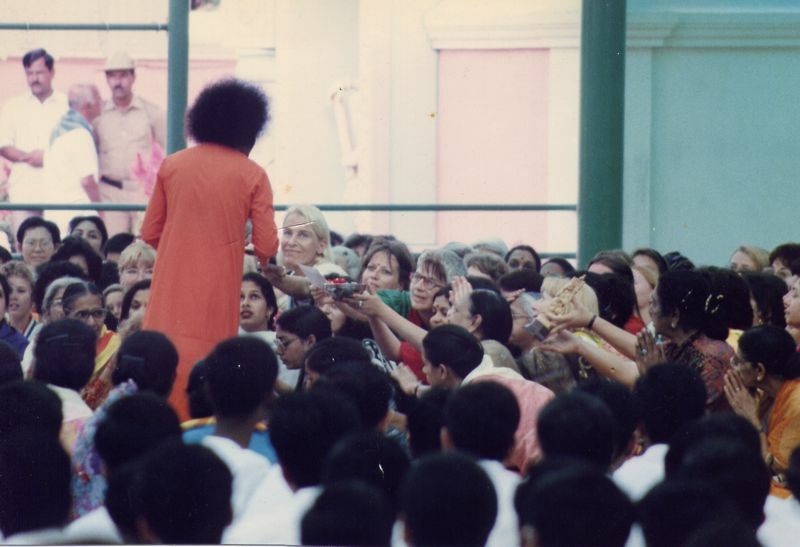 (Swami sings Miras song): O, mind, go to the confluence of Ganga and Yamuna. The point of confluence of Ganga and Yamuna is here, in the centre of the forehead. Here is the seat of God. It is not an ordinary seat. It is His coronation seat. Start the day with love, Fill the day with love, Spend the day with love, End the day with love.